FROM THE SHEARING SHED TO ONE OF AUSTRALIA’S MOST RESPECTED TRAINERS. Keith underwent shoulder surgery recently, and wasn’t able to make the trip to Rosehill to saddle up his promising three year old Handle The Truth, in the TAB Highway event. 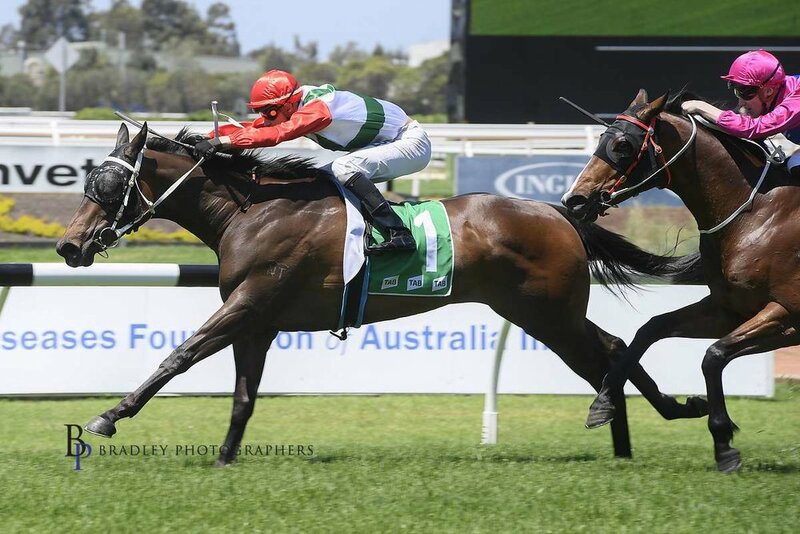 Training partner Scott Collings did the honours in town, while Keith watched the action at home, and was thrilled to see Handle The Truth make it four from seven, with a very gritty display. The son of Star Witness raced outside the leader throughout, before repelling a couple of late challenges. The gelding was bred, and is raced by a large syndicate put together by Louis Mihalyka, founding father of Laurel Oak Bloodstock. Several of the gelding’s owners, are long term clients of the Dryden stable. Laurel Oak originally intended to put Handle The Truth through an Inglis sale, but Louis was fearful the colt’s pronounced parrot mouth would detract from his value. He was only partly syndicated when he sent him to Keith, but the trainer put him straight into work nevertheless. “By the time we completed the syndicate, I had a pretty good idea he was going to win some races”, recalled Dryden. It wasn’t all plain sailing in the early stages of Handle The Truth’s education. He developed the quirky habit of wanting to veer off the track at the most unlikely times. Most horses with this tendency, will usually offend near a gate or a gap through which they’ve come on to the track, but not Handle The Truth. “He won a “jump out” by a big margin one morning with experienced rider Brendan Ward in the saddle”, said Keith. “He made no attempt to run off at the point where he entered and exited the track most days, but as he was pulling up in the back straight, he suddenly veered and looked like he might jump the outside fence. We had a few anxious moments with him, but thankfully he’s given all that nonsense away”. The astute trainer will closely monitor Handle The Truth’s progress over the next few days, before determining whether to press on, or head for the paddock. Keith Dryden loved horses from an early age, but the necessity to put food on the table sent him in several different directions in his early years. He spent some time in a Dubbo shearing shed, before eventually finding his way to Canberra where he bought a ready mix concrete truck. He contracted that truck for around eight years, during which time he got to know the skillful veteran trainer Jack Gordon, who became his unofficial mentor. Keith spent a great deal of time, mornings and afternoons at the Gordon stables and attributes his subsequent success, to the wise counsel of this remarkable old horseman. Keith’s first horse as a trainer in his own right was a mare called Minvari. He delights in telling the yarn about Minvari’s win in a Canberra Maiden, ridden by a long retired, wily bush jockey. “He hadn’t even dismounted when he enquired about the likelihood of a cash present”, recalled Keith. “He said he’d be around next morning to collect the gratuity, and he was there early, waving a phone bill under my nose. He told me if $700 wasn’t paid straight away, his phone would be cut off. Minvari did him a huge favour”. Keith speaks affectionately of a few special horses, who helped shape his career, and I get the feeling Tumble On is the stand out. Keith was delighted one day at the races in the mid-eighties, when respected owner Arthur Menzies, promised to send him a horse to train. A few days later a big, strong chestnut gelding arrived at the Dryden stables destined to launch the career of his new trainer. His name became Tumble On, he was by Tumbledownwind (Ire) who could pop up with a nice horse from time to time, and his dam was a daughter of Kaoru Star. His Maiden win at Canberra was the first of eighteen for the long striding chestnut, with eleven minor placings thrown in. He won the Listed Hall Mark Stakes on two occasions, the Listed Royal Parma Stakes, the Group 2 Villiers, and a Randwick Country Cup. His prize money tally of $298,000 doesn’t seem a lot, but it was pretty healthy thirty years ago. Keith’s second favourite is undoubtedly the immensely talented Into The Night, who raced twenty nine times for nine wins and seven placings for $804,000. He and Louis Mihalyka looked at the colt many times at a Magic Millions night session, before deciding that $60,000 was their absolute maximum bank. “Louis was away looking at another yearling, and I got a rush of blood when somebody else bid $60,000”, reflected Keith. “When Louis got back I told him we’d need a bank loan to cover the extra $20,000 I had to spend to get him”. Into The Night ticked every box. He was tractable; he had natural speed and loved a fight. 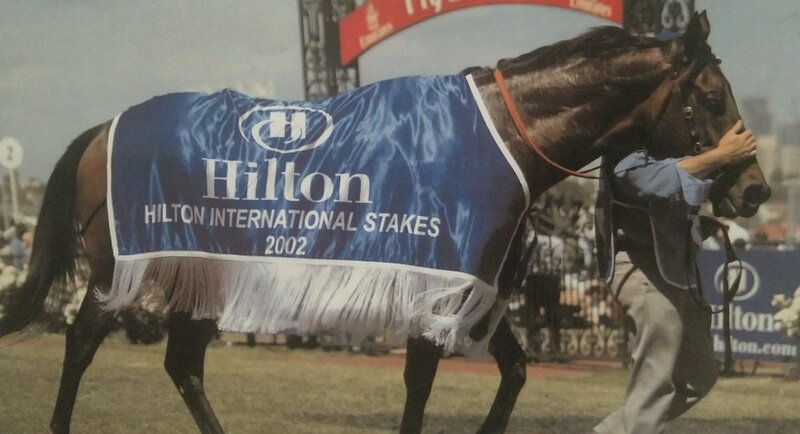 His wins included a Group 2 QTC Cup, a Listed Starlight Stakes, and the Hilton International (Listed) over the Melbourne Cup carnival on two occasions. He was second once at Group 2 level, and twice at Group 3. His Group 1 record is very notable, and with an ounce of luck could have been better. He was fourth in a Newmarket, third in a Stradbroke, and an agonisingly close second in the Salinger Stakes, when little went right. “He got in the squeezebox just after the start, and got much further back than he should have been”, said Keith. He went under by only half a neck to the well handicapped Ancient Song, and to this day Keith regards it as the one that got away. Keith was saddened to learn only last week, that Into The Night had all but foundered on a local agistment property. The old gelding had been suffering chronic arthritis for some years, and was finding it difficult to stand. Vets made the decision to euthanize him, almost on the fifteenth anniversary of the Group 1 he should have won. Another of Keith’s favourites was Tumble On’s full brother Roll On By. He wasn’t as good as his older brother, but good enough to win twenty races, the majority at Canberra. 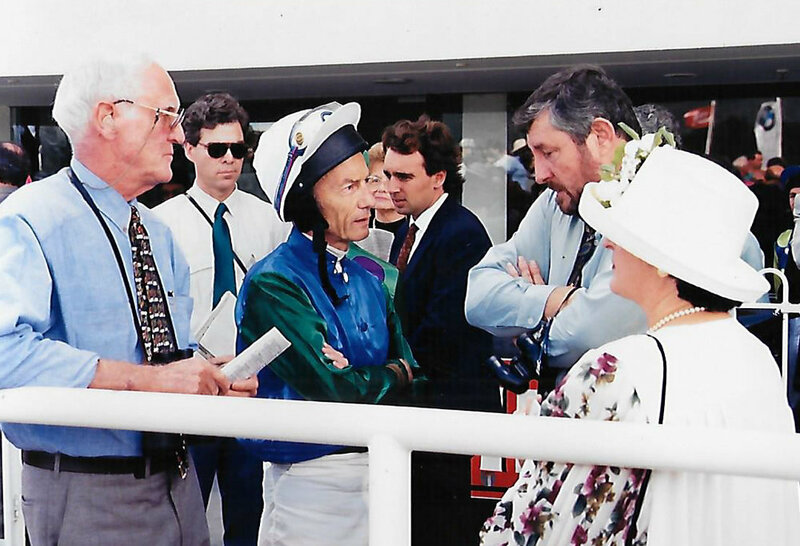 Keith had a brush with fame on two occasions when the iconic jockey Lester Piggott, rode Roll On By at major Canberra meetings. He won a Quality sprint on the gelding in February 1995, and Keith has never forgotten his immediate post-race comments. “He said the horse raced generously, but advised me to keep an eye on his forelegs”, recalled Keith. “He obviously felt something in his action which suggested the horse was feeling a little bit of discomfort”. 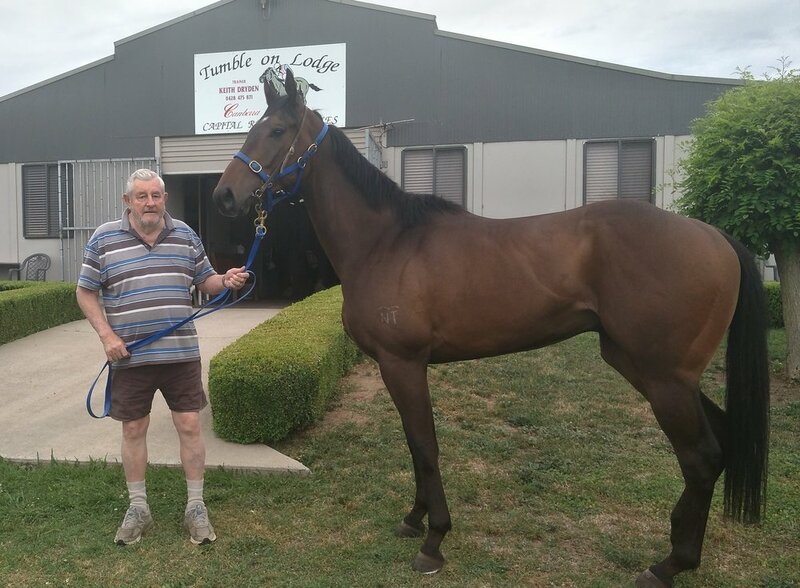 The four time Canberra premiership winning trainer, broke new ground a couple of years ago when he invited thirty eight year old Scott Collings, to join him in a partnership. Scott was training in his own right out of Goulburn, and was actually pre training horses for Keith. The former jockey jumped at the opportunity, and the transition was smooth. Keith has twenty three of the team in Canberra, while Scott looks after a dozen at Goulburn. The horses are interchanged according to circumstances. And so Keith Dryden enters a new phase of his long career in racing. In his quiet moments he can reflect on close to 1,500 winners, several special horses, and winning associations with jockeys like Gary Buchanan, Dale Spriggs, Kevin Sweeney and Matthew Cahill who’s doing the bulk of the stable riding currently. Nick Heywood who rode Handle The Truth so capably on Saturday, is obviously assured of further opportunities. The trainer has had some very talented junior riders in his care, over the years. Jay Ford began his apprenticeship with Keith, before transferring to Kim Waugh. Karen Dodds and Rachel Hunt rode many winners for the stable, and Keith speaks highly of a young lady currently working for him. Her name is Zara Castellaz-Faico, and she’s a late starter at thirty three. “She’s not riding in races yet, but if determination counts she soon will be”, said the trainer. She looks a natural, and is tremendously keen”. 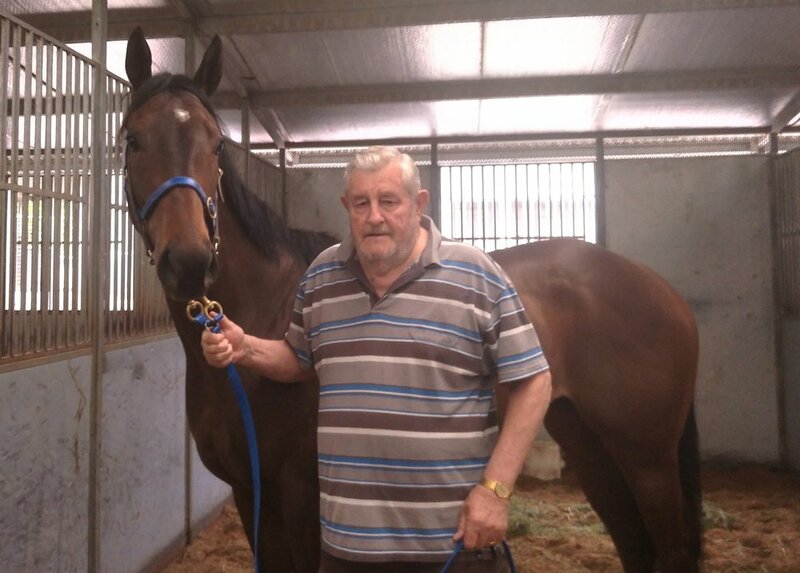 Keith Dryden is pretty keen himself, for a bloke who’s been a commercial horse trainer for more than forty years. His great friend and loyal client Louis Mihalyka, has been around for three of those four decades. “Keith has been a fantastic asset for us over the years, as a good bloke and a good trainer”, said Louis. “He places his horses well, and we have won many races together, at Group level with Into The Night down to country maidens. We are very appreciative of his great help and friendship over the years, and look forward to many more winners together”. That says it all Mr. Mihalyka.